Speaking calmly and slowly from the Elysee Palace, the 40-year-old head of state confessed that the anger of protesters was "deep, and some of their claims legitimate." He added that these protests come from "40 years of malaise." Macron announced that the minimum wage would increase by 100 euros per month in 2019. He also said that a tax hike for the poorest pensioners will be cancelled at the start of the next year. His address comes two days after protesters from the Yellow Jackets movement -- named after the neon-yellow security vests demonstrators have been wearing -- took to the streets of France for the fourth weekend in a row. A spokesperson for the French interior minister told ABC News that 136,000 people demonstrated in France on Saturday, including 10,000 people in Paris. For the third Saturday in a row, the demonstration in Paris turned violent on the famous Champs-Elysees Avenue, and in other areas of the French capital. Dozens of angry protesters, many of them wearing gas masks or ski goggles, threw rocks and projectiles at French police. They burned dozens of cars, set up barricades and broke store windows before looting them. In turn, police attempted to disperse the crowd by firing tear gas and blasting water cannons. During his address on Monday, Macron said authorities would not stand for violence and that "no anger justifies" attacking police or looting stores, adding that he would use "all means" to restore order. 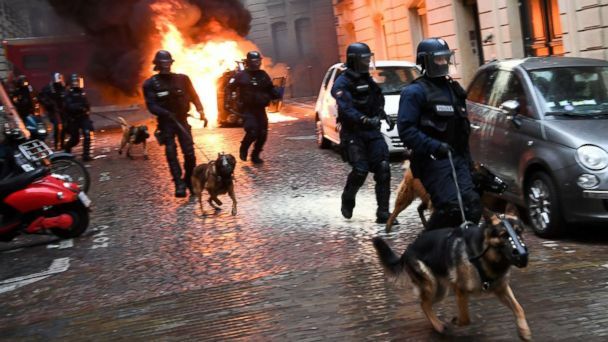 More than 1,700 people were arrested all over France last Saturday, including around 1,000 individuals in Paris, according to the French interior ministry. Around 320 people were injured during protests across the country on Saturday, including 39 police officers, authorities said. The nationwide Yellow Jackets protests started in small urban centers and rural areas of the country in response to a proposed fuel price hike, and demonstrators have been blocking roads over the past three weeks. French Prime Minister Edouard Philippe announced last week that he was backing down from the proposed fuel price hike. "No tax is worth putting the nation's unity in danger," Philippe said during a press conference last Wednesday. However, the protests have continued, and turned into a broader rebuke against the economic policies of Macron and the French ruling class, which many citizens view as elitist and indifferent to their struggles. The movement has no clear leader and has attracted groups of people with a wide variety of demands. Various Yellow jacket Facebook groups have already called for more nationwide protests in France on Saturday, Dec. 15.